Why do yield differences among tillage methods occur in heavy soils? Traditionally, most corn land in Wisconsin has been prepared for planting by moldboard plowing followed by a number of secondary tillage operations. In recent years conservation tillage systems have become more popular. In the past, tillage was required for three main purposes: (a) weed control; (b) burial of residue from the previous crop; and (c) preparation of a satisfactory seedbed. Since the late 1950's chemical herbicides have reduced the need for tillage in a weed control program. However, some chemicals need to be incorporated into the soil and some weed escapes may need to be controlled by interrow cultivation. Burial of crop residue is becoming less important. Many newer corn planters are designed to operate despite trash on the soil surface. Residue left on the soil surface can be beneficial since it helps hold the snow in winter and assists in reducing soil loss from runoff. The most important reason for tillage is to prepare a seedbed. For this purpose secondary tillage does not need to be deeper than 5 to 7 cm. Tillage does affect yield but the response varies significantly with soil texture. No tillage treatments have been found that produce higher yields than the traditional combination of fall moldboard plowing, followed by secondary tillage. However, other systems are frequently used to reduce cost and/or soil erosion. Corn planted with no-tillage following corn has averaged about 6 to 15% lower yield than with conventional tillage in most situations. On sandy and gravelly loam soils or where corn has followed crops other than corn, yield differences caused by no-tillage have been smaller. Corn yields with chisel plowing have been similar to those following moldboard plowing on sandy loam soils, but not on silt loam, clay loam or clay soils. However, where corn is grown following crops other than corn on fine-textured soils, chisel plowing has resulted in yields similar to those after moldboard plowing. Moldboard plowing, followed by such secondary tillage operations as disking and harrowing, was once the most common, or traditional, tillage system before planting. Soil erosion potential from rainfall on sloping lands was great and requirements for labor and fuel were high compared to other tillage and planting systems. Conventional tillage is any system which attempts to cover most of the residue, leaving less than 30% of the soil surface covered with residue after planting. Usually, the moldboard plow is used in conjunction with a variety of other tillage implements. Machinery is familiar and widely available. System is flexible and adaptable to a wide range of soil and crop conditions and manure handling systems. Tillage may be used to control weeds throughout the growing season. Soils warm faster when crop residues are incorporated. Equipment, fuel and labor costs associated with seedbed preparation are higher. Field traffic is greater, increasing the risk of compaction and the spreading of weeds in the field. Risk of soil erosion by wind and water as well as crusting are greater with inadequate surface residue. Tillage reduces organic matter levels. Typical operations: Fall or spring plow; one or two spring diskings or field cultivations; plant; cultivate. Suited to most soil and management conditions. Suitable for poorly drained soils. Highest fuel and labor costs. Typical operations: Fall chisel; one or two spring diskings or field cultivations; plant; cultivate. The chisel plow produces a rough surface and leaves about 50 to 70 percent of the existing corn residue on the soil surface, depending on chisel point selection, shank spacing, operating speed and depth. Straight, narrow points, about 2 inches wide, leave the most residue. However, following soybeans, even narrow points bury too much residue to be considered conservation tillage. Where erosion is not of primary concern, 3 or 4 inch wide, twisted points may be used to invert more of the soil, burying more residue. Wider sweeps on the chisel plow are sometimes used in wheat residue to undercut weeds and still leave substantial amounts of residue. The type of chisel point influences the amount of residue remaining on the soil surface. Typically the chiseling operation is performed in the fall and followed by one or more secondary tillage operations in the spring. The fall operation cuts and incorporates some of the residue, making it more susceptible to decomposition and over-winter weathering than undisturbed residue. This partially decomposed residue is easily broken up and covered by secondary tillage operations, negating much of the effect of selecting chisel points which leave more residue. On many soils a single spring pass with a disk, field cultivator or combination tillage implement provides limited pesticide and fertilizer incorporation on fall chiseled fields. A second pass may be appropriate for more complete incorporation, but residue cover and erosion control will decrease. Chisel plowing in the spring provides erosion control over the winter and allows extended grazing of stalks. The loss of soil moisture through evaporation following spring tillage can result in yield reductions, particularly in lower rainfall areas. Spring chiseling also may produce clods that could require additional tillage operations to produce a suitable seedbed. In extremely heavy or wet residue, the chisel plow may clog unless stalk shredding or light tillage precedes chiseling. Several combination tillage implements have coulters or disks mounted in front of the chisel shanks that eliminate the need for a pre-chiseling operation. Less erosion than from cleanly tilled systems. Less winter erosion potential than fall plow or fall disk. Well adapted to poorly drained soils. Larger number of operations cause excessive soil erosion and moisture loss. In heavy residues, stalk shredding may be necessary to avoid clogging of chisel. Typical operations: Fall or spring disk; spring disk and/or field cultivate; plant; cultivate. Well adapted for lighter to medium textured, well-drained soils. Soil compaction associated with disking wet soils. The tandem disk harrow is the most commonly used tillage implement. Typically, a field cultivator is used for final seedbed preparation with a disk system. Forty to 70 percent of the residue generally remains on the surface after a single disking of corn, grain sorghum or wheat residue. Generally, disking corn or grain sorghum residue more than twice destroys too much residue for effective erosion control. If a field cultivator is used for final seedbed preparation, only one disking should be used. In soybean residue even a single pass with any tillage implement will not leave enough residue cover for effective erosion control. Disking in the fall saves time in the spring, but the potential for erosion from wind and rain is increased, and snow entrapment is decreased. A spring disk system minimizes erosion during the winter, and is well suited to adequately drained and lighter textured soils. The disk is commonly used for incorporating herbicides and other surface applied materials. A common problem is that soils are often disked when too wet. Disking wet soils may not uniformly incorporate surface applied materials and can create clods that require additional tillage. It also can create a compacted soil layer below the depth of disking that may restrict root growth and reduce yields. The field cultivator is used as a secondary tillage implement immediately preceding planting. The amount of residue covered by a field cultivator depends on the amount of time and weathering since the primary tillage operation. If the field cultivation occurs two or three days after the primary tillage operation, the field cultivator may not reduce the residue much further. In some circumstances, particularly with corn residue, field cultivation immediately following the primary tillage operation may in fact increase the residue cover by a few percentage points. On the other hand, if time between the primary tillage operation and the field cultivation allows for some precipitation and weathering of the residue, the field cultivator will significantly reduce the residue cover. Some producers no longer use the disk, but use instead one pass of a field cultivator or combination tillage implement. Unfortunately, the most common use of this one-pass tillage system is in soybean residue. While successful in fields where erosion is a minor concern, these implements generally do not leave enough soybean residue to effectively reduce soil losses on fields prone to erosion. Typical operations: Chop stalks (on furrow irrigation); plant on ridges; cultivate to rebuild ridges. Excellent erosion control if on contour. Ridges warm up and dry out quickly. Low fuel and labor costs. Soil is protected from wind and water erosion, and erosion due to tillage is reduced. Machinery costs are lower than for conventional tillage. Controlled traffic reduces compaction in the crop rows. Inter-row cultivation and ridging operations control weeds. Narrow row soybeans and small grains not well suited. Inter-row cultivation is required to rebuild ridges. Ridges must be leveled before forage crops can be grown. Wheel spacing of all machinery must be modified to avoid driving on ridges. In ridge systems, crops are planted into ridges formed during cultivation of the previous row crop. A band application of herbicide behind the planter typically is used in the row for weed control. Crop cultivation controls weeds between the rows and rebuilds the ridges for the following year. Ridge systems help control erosion by leaving the soil covered with residue until planting. After planting a 30 to 50 percent residue cover may be left, but the residue is not uniformly distributed. Residue-covered areas between the rows alternate with residue-free strips in the row area. For erosion control the NRCS specifies the ridge must be 3 to 5 inches higher than the furrow after planting, and the ridge must be shaped to shed water to the furrow. For the most effective erosion control, ridge systems should be used around the hill. Two cultivations are generally required in ridge systems, the first to loosen soil and control weeds, the second for additional weed control and to rebuild the ridges. For ease of planting next season, the ridges should be rounded or flat topped, and 6 to 8 inches tall after cultivation. Proper ridge shape and annual maintenance are keys to a successful ridge system. Care must be taken not to damage or destroy the ridges by wheel traffic, particularly during harvest. Level or gently sloping fields, especially those with poorly drained soils, are well suited to ridge systems. The elevated ridges tend to shed some residue to the row middles, allowing earlier soil warming in the spring. This warming, combined with drainage from the ridge, allows soil in the ridge to be drier at planting time than unridged soil. Ridge systems can be an excellent choice for furrow irrigated fields. Ditching, furrowing or hilling for irrigation provides suitable ridges for planting on the following year. To aid in furrow irrigation, especially on flat soils with higher infiltration rates, some producers chop stalks or perform a high speed tillage operation to remove residue from the ridges. In a ridge plant system, row cleaning devices on the planter push a small amount of soil as well as residue and weed seeds lying on the soil surface off the top of the ridge. Ridge cleaning components include sweeps, disk furrowers and horizontal disks. Except for possible nutrient injection, no soil disturbance occurs prior to ridge planting. In contrast, ridge till systems have some tillage prior to planting. The tillage is generally shallow, disturbing only the ridge tops but not completely destroying them. This tillage can be used to flatten or smooth peak-shaped ridges to aid in keeping the planter on the old row. Depending on the tillage implement used, some control of emerged weeds and/or incorporation of herbicide in the row area is possible. However, the tillage also incorporates some of the weed seed, rather than removing it from the row. The most common ridge till system uses a rotary tiller with planting units mounted behind it. To maintain the old row and avoid excessive power requirements, the rotary tiller should be operated only in the top 2 or 3 inches of the ridge. Rotor tines should be limited to, or at least concentrated in, the row area to provide a strip till configuration. Some additional tines can be included between the rows if it is necessary to break up residue or to kill growing weeds. Other types of ridge till systems include use of mulch treaders, rolling stalk choppers or flexible harrows. Regardless of the tillage implement used, the operating depth should be shallow and chemical incorporation should not be a tillage goal. With shallow tillage, the old row should remain visible. Mulch tillage systems disturb the soil at some point between harvesting one crop and planting the next but attempt to leave residues on the surface. More than 30% of the soil surface is covered with residue after planting. Chisel plows (with or without coulters or discs) or offset discs are the common primary tillage implements used. Mulch tillage is also referred to as reduced tillage, minimum tillage or conservation tillage. Soil erosion and water runoff are reduced. Input costs are lower compared to conventional tillage. Many of the advantages of conventional tillage are maintained. Planter modifications may be required. Soil warming in the spring can be slower due to crop residues. Primary tillage may not be effective under wet soil conditions. A larger tractor may be required for primary tillage. Typical operations: Spray; plant into undisturbed surface; postemergence spraying or cultivation as necessary. In this system, no tillage operations are performed between harvest of one crop and planting the next. In most no-till systems, planter-mounted coulters till a narrow seedbed to assist in seed and fertilizer placement. No-till is also referred to as zero-till. Minimum fuel and labor costs. Input and equipment costs are lower than other tillage systems. Soil erosion by wind, water and tillage is greatly reduced. Labor inputs per acre are greatly reduced. Increased dependence on herbicides. Weed control is largely dependent on herbicides. Not well suited for poorly drained soils. Initially high residue levels can slow soil warmup. Attachments, such as coulters, must be added to planters and drills. High management level is required. Tillage is essentially eliminated with a no-till system. The crop seed is placed in a narrow strip opened with a coulter or disk seed furrow opener. Most currently available planters can be used in no-till systems with little or no modification. Common options or attachments include coulters, stronger down-pressure springs and weight for penetration. Tilling only a narrow slot in the residue-covered soil achieves excellent erosion control. Shredding standing crop residue prior to planting is not recommended in no-till systems. Performance of planters, drills and cultivators is improved when the residue is standing and attached to the soil, rather than when unattached and lying flat. Although weed control is essential to all systems, the lack of tillage for incorporation with no-till requires preemergence, surface applied or postemergence herbicides. One or two properly timed applications may be necessary. For later planted crops, such as grain sorghum and soybeans, an early preplant herbicide application at a one-half or two-thirds rate, near the first week of April when the probability of rainfall for herbicide incorporation and activation is high, has proven successful. This eliminates the need for a burndown herbicide. For full season weed control a second, lighter preemergence herbicide application at planting time, a postemergence treatment, or crop cultivation may be needed. No-till planting is well suited to many soils. Residue, when uniformly spread, increases water infiltration and reduces soil moisture evaporation. In some poorly drained soils covered with large amounts of residue, the use of no-till may delay soil warming and drying in the early spring, which delays germination and emergence. This condition is rare for normal planting dates. When colder and wetter soils are of concern with early planting dates, the use of no-till planter attachments designed to move only residue and not soil away from the row have proven successful. Another option would be the adoption of a ridge system to aid in warming and drying of the row area. Subsoiling is often used to try to loosen compacted areas of fields where heavy loads have passed. Harvest of some crops results in severely compacted areas that require subsoiling. Generally, subsoiling does not have a long-term effect. Soil management, harvesting and manure application practices must change to avoid further problems. These changes include lighter loads and staying off the soil when it is wet. Nitrogen Nitrogen (N) applications on cereals are similar for all tillage systems. Broadcasting urea on the surface can result in significant losses of nitrogen if it is not incorporated into the soil. This is particularly so for high residue conditions. The nitrogen required for corn should be placed below crop residues. In high residue situations coulters may be necessary for proper placement. Phosphate and Potash Phosphate (P) and potash (K) requirements are applied with the planter or drill as a starter fertilizer. This is particularly important in no-till or ridge till systems when soil test levels are low. In high residue conditions, coulter in front of the fertilizer opener will improve placement. Requirements above what can be safely applied with the planter or drill should be broadcast. Tillage equipment can do a good job of incorporating fertilizers in a mulch till system. Coulters will do some incorporation of broadcast fertilizer in a no-till system. Note: Soil testing and fertilization are very important in any tillage system. Fertility levels should be at least in the medium range before starting no-till as it is hard to incorporate large amounts of fertilizer without tillage. The shift to conservation tillage practices is driven mainly by the benefits earned through soil and energy conservation and environmental protection. Changing tillage practices can alter the ecosystem in the field due to changes in weeds natural enemies, microenvironment and crop residues. While, on the whole, it is difficult to measure these changes and their impact on insect and disease pests, there are some instances where increased risks of diseases and insects occur with reduced tillage, and some extra precautions may be necessary. However, these risks are small when compared with the overall benefits derived through conservation tillage practices. Weed control is important to the success of any tillage system. Weed control in conservation tillage does require some changes in management. Slugs are the most important concern, because they benefit from cover crops (including weeds), heavy crop residue and wet conditions. Slugs can do the most damage to young bean crops because the growing point of the plant is exposed to feeding. Cutworm moths are attracted to green cover provided by winter annual weeds and overwintering crops. These are often more prevalent in no-till situations. Eggs are laid well before planting and often before the cover crop has been burned off with an herbicide. Spider mites can build up in clover which has been underseeded in wheat. If the clover is left until spring, and soybeans are no-till planted shortly after the clover has been burned off with a herbicide, mites can move onto the soybean seedlings. With hot/dry weather a serious infestation could result. Armyworm, Potato stem borer, and Grasshopper pests can occasionally be more troublesome under reduced tillage, but usually are the result of weed problems (particularly grasses) in the field. Cereal leaf beetle Winter wheat crop residue left on the soil surface provides habitat for parasitic insects which have been very effective in controlling cereal leaf beetle. Without these parasitic insects, growers would be spraying insecticide regularly to control this pest. Other beneficial insects: Leaving crop residues undisturbed provides habitat for many beneficial insects and spiders. Many of these creatures are important predators and parasites which help to keep pest problems in check. Others are decomposers which help with plant nutrient cycling. Significant increases in the number of beneficial insects and spiders have been noted in reduced tillage systems. Crop rotation is an excellent method for controlling many insects because it disrupts their life cycle. Good weed control reduces the number of egg laying sites for those insects attracted by weeds. Keep annual and winter annual weeds under control in the crop, because these can provide just as much shelter for slugs and insects as crop residues do. For example, cutworm moths are attracted to winter annual weeds to lay eggs well before the crop is planted. Moving residue away from the row area at planting exposes slugs and insects which need the cover to survive. It also allows the soil to warm up. Warmer soil helps plants to emerge and grow faster which improves their ability to outgrow damage from slugs and other insects. Kill cover crops or weeds early (prior to planting) because they can harbor or attract insect pests. Reduced tillage leaves crop residue on the soil surface and may increase some diseases in the following crop. Other diseases may decrease under conservation tillage. For most diseases, crop rotation provides enough time for the diseased residues to break down. Some diseases can persist longer than one year, while others can attack more than one crop. The presence of a disease-causing organism does not mean that a severe outbreak will occur. Infection and disease development are dependent mainly on weather conditions. In most years conditions favorable to disease do not occur. The susceptibility of the crop and the previous cropping history of the field will also affect the disease level. Fusarium head blight in winter wheat: A major concern with reduced tillage has been a higher risk of fusarium head blight in winter wheat when planting into reduced-tilled corn stubble. The fusarium which causes fusarium ear mould in corn also causes fusarium head blight in winter wheat. Avoid planting winter wheat after corn, particularly under reduced tillage. Anthracnose and eyespot in corn: There is some evidence that corn grown under conservation tillage can be more prone to anthracnose and eyespot. These problems are rare however and usually occur only under warm and extremely wet conditions. Phomopsis seed mold, and phytophthera root rot in soybeans The risk of these two diseases in soybeans is slightly higher under conservation tillage. White mold in beans: Leaving crop residue entirely on the soil surface can reduce the survival of some disease organisms. The overwintering bodies (sclerotia) of white mould can persist for many years when buried in soil by tillage. However, if these sclerotia remain on the soil surface they can only survive for one year. With no tillage, the bank of viable sclerotia can be depleted rapidly, reducing the risk of infection from within the same field. This will not prevent infections from surrounding fields, but these are often less severe. The selection of a correct cropping sequence is critical in a conservation tillage system. Potential disease problems increase when a crop is planted into its own residue from the previous season instead of that of a non-related crop. When two crops susceptible to the same diseases are to be planted in sequence, plant the most susceptible crop first. Plant disease resistant varieties where available (for example, phytophthora resistant soybeans). Many varieties presently grown are resistant to some of the most serious diseases of field crops. Planting certified seed ensures good germination and seedling vigor. Because this seed is harvested from fields with no visible disease symptoms, it is an excellent method for controlling seedborne diseases (e.g., bean common mosaic virus). Good control of weeds often reduces potential inoculum sources in or around a field. It also discourages insect pests that may transmit or help in the dispersal of plant diseases. For certain diseases, seed treatment or foliar fungicide applications are as effective and practical means of control. Seed treatments should be used routinely, particularly where non-certified seed is planted. The viability of plant diseases harbored on crop residues decreases over time. A crop rotation sequence of two or three years allows for sufficient weathering of the residue so that the residue becomes less of a factor in disease development. Conservation-tillage soils tend to be wetter and cooler in the spring. This may delay seed germination and seedling development which can lead to seed decay, seedling damping-off and root rots. Therefore, it is beneficial to move surface residue away from the row to provide a residue-free area. This can be done by adding extra coulters or trash whippers on the planter. Cover crops reduce soil erosion potential by keeping the ground covered between grain crops, by improving soil structure and, in conservation tillage systems, by increasing surface residue cover. Possible disadvantages of cover crops in conservation tillage systems include excessive moisture depletion in spring (especially if planting is delayed), increased insect damage (eg. possible armyworm after rye and slugs after red clover) and possible inhibition of following crop growth by compounds released from the cover directly or after decomposition. The cover crop should be killed at least two weeks before seeding corn or soybeans to minimize any early crop growth suppression. Killing the cover crop in the fall should be considered if moisture may be limiting in the spring. Fall treatment also provides the opportunity to treat escapes in the spring. Coulters or trash whippers added to the planter to remove cover crop residue from the row will reduce pest problems and improve early growth. Interpretation of the results of any spring nitrate sampling should be adjusted due to the fact that delayed chemical kill of legume cover crops delays nitrate release from that cover crop. Although cover crops may assist in suppressing certain weeds, herbicides are generally still required. Monitoring for disease and insect damage is important. Seed treatments which include insecticides are highly recommended. Some regrowth of winter annual, biennial or perennial cover crops will occur in the following crop year. Usually this is easily controlled with normal herbicide treatments in the following crop. The first mulch tillage operation with overwintering cover crops should occur at least 2 weeks prior to planting to minimize the negative effects of compounds released by the crops. It may be difficult to prepare a seedbed if persistent cover crops are not tilled until spring. Cover crops that do not survive overwinter may be an option, especially on more poorly drained soils. Burndown herbicides should be considered before mulch tillage of overwintering cover crops. If someone should tell you no-till isn't really no-tillage (or no soil disturbance), tell them they're absolutely right. In the U.S., the term "no-till" merely identifies the one system designed to produce crops with the least amount of tillage. You're still making a small groove or slit in the soil to plant the seed. However, the term no-till is so easy to remember and say that it is often used in place of conservation tillage in casual discussion. Canadian farmers avoid the no-till misnomer. They use the term "direct-seeding." Perhaps farmers in the Midwest have hit upon a true form of no-till. During severely wet planting seasons, some will hire pilots to drop soybeans from airplanes onto cropland. That, they say, is "true no-till!" On the serious side, while this may seem a bit frivolous, it does point to a more serious side of this broad range of systems we call "conservation tillage." While the goal for each is to leave 30 percent or more crop residue after planting, the flexibility to "till a little more or make another pass," is always the producer's prerogative, more so with some conservation tillage systems than others. For instance, both mulch-till and strip-till systems allow for more flexibility in tillage, which can make it easier to fall short of higher residue goals. Any tillage and planting system that covers 30 percent or more of the soil surface with crop residue, after planting, to reduce soil erosion by water. Where soil erosion by wind is the primary concern, any system that maintains at least 1,000 pounds per acre of flat, small grain residue equivalent on the surface throughout the critical wind erosion period. No-till - The soil is left undisturbed from harvest to planting except for nutrient injection. Planting or drilling is accomplished in a narrow seedbed or slot created by coulters, row cleaners, disk openers, in-row chisels or roto-tillers. Weed control is accomplished primarily with herbicides. Cultivation may be used for emergency weed control. Ridge-till - The soil is left undisturbed from harvest to planting except for nutrient injection. Planting is completed in a seedbed prepared on ridges with sweeps, disk openers, coulters, or row cleaners. Residue is left on the surface between ridges. Weed control is accomplished with herbicides and/or cultivation. Ridges are rebuilt during cultivation. Mulch-till - The soil is disturbed prior to planting. Tillage tools such as chisels, field cultivators, disks, sweeps or blades are used. Weed control is accomplished with herbicides and/or cultivation. 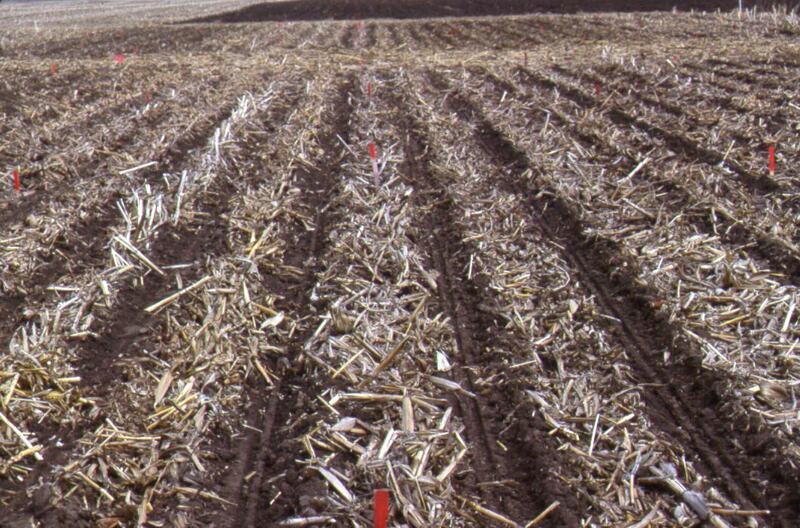 Zone-till and Strip-till - Although these are popular terms in some areas, they are not official survey categories because they are considered modifications of no-till, mulch-till or "other tillage types." Tillage and planting systems that may meet erosion control goals with or without other supporting conservation practices (i.e. strip cropping, contouring, terracing, etc.). Reduced-till - Tillage types that leave 15-30 percent residue cover after planting or 500 to 1,000 pounds per acre residue equivalent throughout the critical wind erosion period. Conventional-till (intensive tillage) - Tillage types that leave less than 15 percent residue cover after planting, or less than 500 pounds per acre of small grain residue equivalent throughout the critical wind erosion period. Generally involves plowing or intensive tillage. *The emphasis on the "30% or more" should often be placed on the "more." Considerably more than 30% cover could be necessary to achieve soil erosion tolerance levels ('T') and related production and environmental benefits. Today conservation tillage systems reduce soil erosion and moisture losses while saving labor and fuel. "Conservation tillage" can represent a broad spectrum of farming methods, provided at least 30 percent of the soil surface remains covered with crop residue following planting. Research in midwestern states has shown that leaving at least 30 percent residue cover reduces erosion from water by more than 50 percent, as compared to a cleanly tilled field. Following corn, grain sorghum or wheat, one or perhaps even two passes with a field cultivator, disk or chisel plow usually leaves about a 30 percent residue cover. Additional operations incorporate more residue, reducing erosion control. Other tillage and planting systems such as ridge plant and no-till leave even more residue, offering greater erosion control. No-till planting is the only system that consistently leaves at least 30 percent residue cover following soybeans. No single tillage and planting system is best for all situations. Selecting the most appropriate system for a particular soil and cropping situation requires matching the operations to the crop sequence, topography, soil type and weather conditions. Rotating tillage and planting systems to coincide with crop rotations often provides an excellent combination. For example, a no-till system following soybeans and a chisel or disk system following corn provides the most erosion control after soybeans, and allows for some tillage in the less fragile and more abundant corn residue. However, rotating tillage and planting systems slows the development of improved soil structure and weed control benefits that often are obtained with the continuous use of either ridge or no-till systems. The most important advantage of conservation tillage systems is significantly less soil erosion due to wind and water. Other advantages include reduced fuel and labor requirements. However, increased reliance may be placed on herbicides with some conservation tillage systems. The moldboard plow system has the greatest fuel and labor requirements for tillage and planting. Compared to the commonly used disk system, no-till requires less than one-half the fuel and two-thirds the labor. The labor savings allow a larger area to be farmed without additional help. Even if increased acreage is not anticipated, more timely planting may result in greater yields. In addition, costs for tractors and tillage equipment is less with fewer tillage operations. Continued use of a no-till or ridge system has resulted in greater yields because of improved soil structure, organic matter accumulation and decreased weed pressures. With limited soil moisture, all conservation tillage systems out-yield systems which have intensive tillage. This occurs because tillage results in moisture losses, and conservation tillage both reduces the amount of tillage and leaves residue on the soil surface, further reducing evaporation and runoff. Recent advancements in herbicides make weed control with no-till easier than with many conventional tillage systems. Longer-lasting as well as early pre-plant herbicide applications are helping assure success with no-till. Regardless of the tillage system selected, residue should be uniformly spread behind the combine using either a straw chopper or straw spreader. With larger combines the addition of a chaff spreader may be desirable, especially when harvesting wheat or soybeans. Uniform distribution of residue and chaff reduces equipment clogging, and provides more uniform soil conditions for planting, easier weed control and better erosion control. The planter's primary job is to place seed where it will germinate and grow. Proper seed spacing minimizes competition for the light, nutrients and soil moisture essential for crop growth. 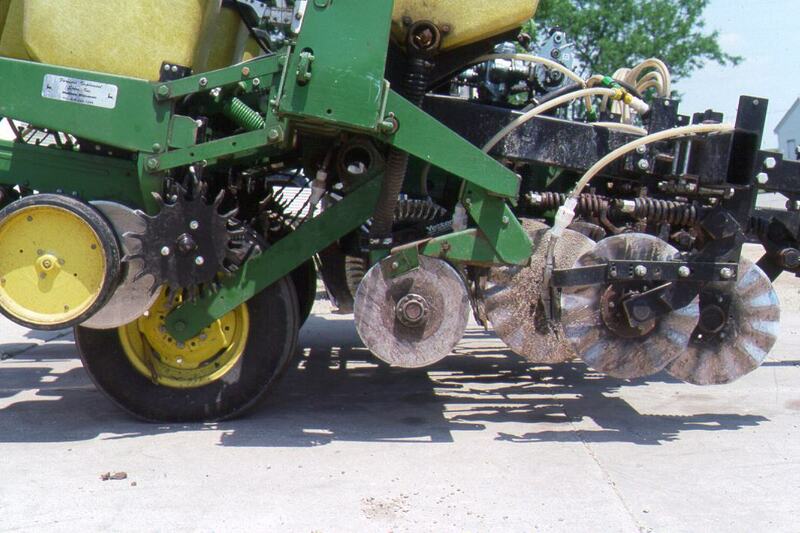 Several factors influence planter performance, including adjustments and correct operation. Field conditions also are important. 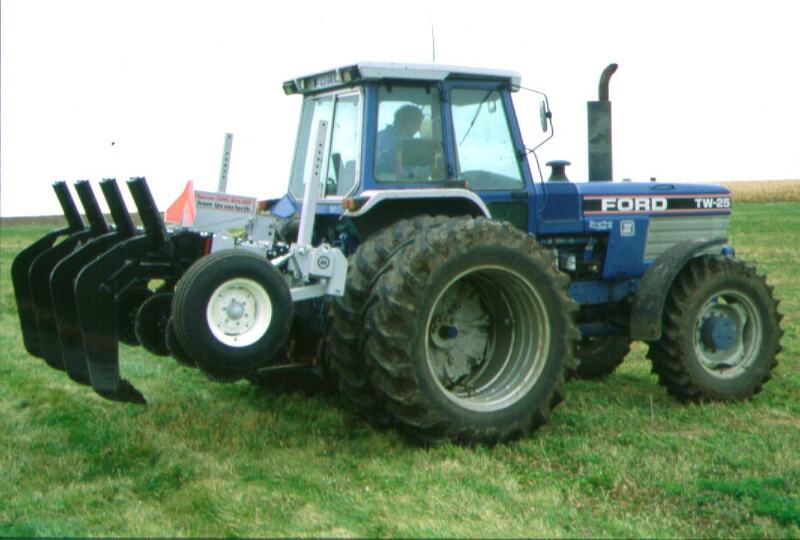 Traditionally, producers used tillage equipment that created a well-tilled, residue-free seedbed for planting. Many producers now are adopting conservation tillage methods that have fewer tillage operations and leave a protective residue cover on the soil surface. Although effective in reducing erosion, these practices have increased concern about seed placement and general planter performance. Tillage systems currently available range from the traditional moldboard plow to conservation tillage methods such as no-till. No-till systems disturb only a narrow strip of soil, leaving most of the residue on the soil surface. This offers the best erosion control. 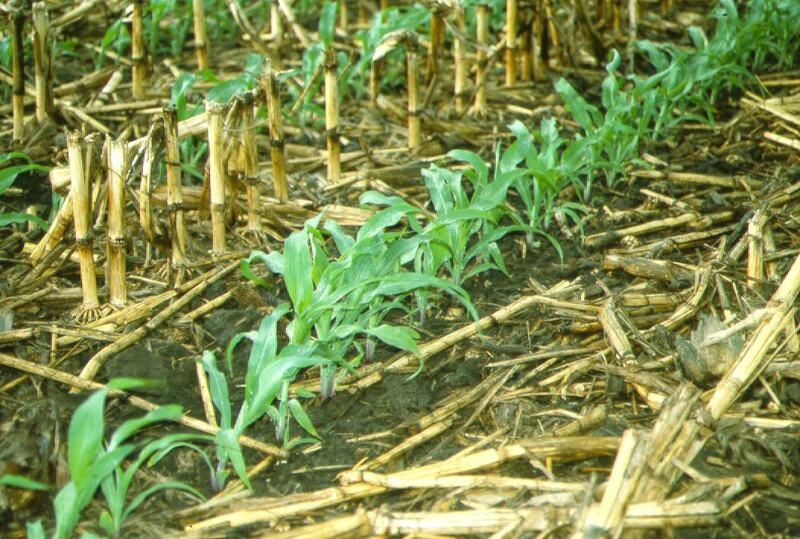 Other conservation tillage systems for corn, grain sorghum and wheat residues can include chisel, disk, rotary-till and ridge plant methods, provided at least 30 percent of the soil surface is covered with residue after planting. However, only no-till consistently leaves more than a 30 percent cover in soybean residue, because of its fragile nature.